Asian elephants are found in most of the countries dry zone jungles and a few of the montane and wet zone forests, but they really come together when the drought hits the dry zones. Being a large herbivore, they require a significant amount of water and food a day. During the dry season in the Habrana area water become scares and the at times the Minneriya reservoir is the only source of fresh water in the area. This combined with the lush green grass that grows on the tanks banks attracts elephants from far and wide to eat and drink. Several different herds gather together to socialize, eat and drink before returning to their respective home ranges after the rains. Rated as no. 6 in the Lonely Planets’ guide to wildlife spectacles of the world, all you have to do is sit and watch as these huge animals drink, play and snack on the green, lush grass that has been exposed by the receding water of the Minneriya Tank. 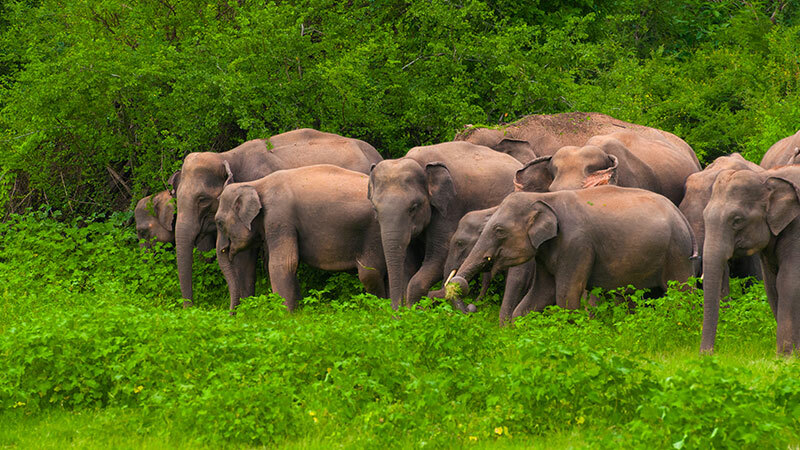 This little area, wild with life, is home for the dry season to over 300 elephants that have come from all over the North Central Province of Sri Lanka. This is not a migration, but an annual coming together of wild animals. Herds come from as far as Kantale to sip the sweet waters of the Minneriya tank.